An increase in the nation's capacity to produce goods and services. Usually refers to real GDP growth. An increase in the production levels of goods and services. If measured in monetary terms, the increases must occur after adjustments for inflation have been made. an increase in the total real' output of goods and services in an economy over time. Economic growth is usually measured in terms of an increase in GROSS DOMESTIC PRODUCT (GDP) over time, or an increase in GDP per head of population to reflect its impact on living standards over time. Because of the contribution of economic growth to wealth creation, and the fact that it provides the government with extra resources to provide social amenities (without having to raise taxation), most governments accord a high priority to the promotion of economic growth in formulating their ECONOMIC POLICIES. The ability of an economy to produce m ore goods and services on a sustained basis depends on many factors including an increase in the quantity and quality of the labour force. capital stock and natural resources (the basic factor inputs available to it); the efficient use of these resources so as to attain a high level of PRODUCTIVITY; the introduction of new innovative techniques and methods of production and new products. The latter two factors are especially important in the context of a world economy where a country's economic growth rate is materially affected by INTERNATIONAL TRADE influences. Finally, a country's own level of demand needs to be sufficiently buoyant both to ensure the full utilization of its existing resources and to encourage producers to invest in new plant and research and development to enlarge the supply capabilities of the economy over the longer term. Governments can stimulate the growth process by increasing current spending in the economy through taxation cuts (see FISCAL POLICY) and by increasing the money supply and reducing interest rates (see MONETARY POLICY). Additionally, it can operate on the supply-side of the economy by promoting enterprise initiatives and providing resources for improving productivity and research (see INDUSTRIAL POLICIES). Fig. 52 Economic growth. (a) Growth in UK GROSS DOMESTIC PRODUCT, 1987–2003. Source: Office for National Statistics, 2004. 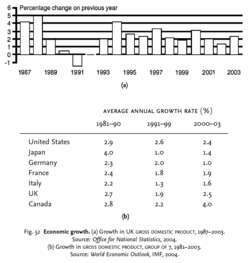 (b) Growth in GROSS DOMESTIC PRODUCT, GROUP OF 7,1981–2003. Source: World Economic Outlook, IMF, 2004. The growth of the real OUTPUT of an economy over time. Economic growth is usually measured in terms of an increase in real GROSS NATIONAL PRODUCT (GNP) or GROSS DOMESTIC PRODUCT (GDP) over time or an increase in INCOME PER HEAD over time. The latter measure relates increases in total output to changes in the population. Therefore, if total output rises only a little faster than the increase in population, then there will be only a small improvement in average living standards. Fig. 52 (a) shows changes in the UK's GDP over the period 1987–2003, and Fig. 52 (b) provides some international comparisons of GDP growth. The achievement of a high rate of economy growth is one of the four main objectives of MACROECONOMIC POLICY. The significance of economic growth lies in its contribution to the general prosperity of the community. Growth is desirable because it enables the community to consume more private goods and services, and it also. contributes to the provision of a greater quantity of social goods and services (health, education, etc. ), thereby improving real living standards. Rapid economic growth, however, can also contribute to the exhaustion of finite natural resources and exacerbate problems of environmental POLLUTION, congestion and ecological damage. a greater quantity of NATURAL RESOURCES (land, raw materials, etc.). For most economies, natural resources are relatively fixed in supply; (ii) a greater quantity of quality of labour. An increase in the LABOUR FORCE can come about through an increase in the population of working age and the number of people in that age range who are actively seeking work, while more education and vocational training can improve labour skills. (See LABOUR FORCE for further discussion); (iii) a greater quantity and quality of CAPITAL, involving both ‘capital widening’ investment (more of the same kind of investment) and ‘capital deepening’ (new investment embodying advances in technology). technological progress. Technical advance through investment in RESEARCH AND DEVELOPMENT, leading to the introduction of new industrial techniques, methods, processes and systems, can bring about major improvements in productivity and output potential. This occurs not only by increasing the sophistication of investment (‘capital-deepening’ effects) but also by combining the capital and labour inputs in a more productive way. At the present time, in particular, the introduction of advanced ‘knowledge-based technologies’ using computers have revolutionized production methods - e.g. computer-aided manufacturing (CAM) and computer-aided design (CAD) - and spawned dramatic breakthroughs in information transmission (e.g. telecommunications and the INTERNET). Moreover, productivity in hitherto relatively labour-intensive service sectors of the economy have also been raised by these developments; for example, in banking, insurance, etc., paper-based manual data processing and recording has been largely replaced by electronic recording systems, speeding up operations and saving on the labour input. The ‘demand side’ of an economy is also important. An increase in the economy's potential growth rate can only be taken full advantage of (i.e. potential turned into actual growth) provided the economy is being operated at a high and expanding level of AGGREGATE DEMAND. Keynesian economists in particular place great emphasis on the role of the ACCELERATOR in putting pressure on existing capacity and, by expanding profit opportunities, encouraging businesses to increase investment in new plant and machinery, etc. Economists often distinguish between ‘exogenous’ and ‘endogenous’ growth impulses. The former embraces developments that emerge from outside the existing economic system and that then impact upon it. Earlier economists (the ‘classical’ school) classified population growth (and thus the size of the labour force) and technological progressiveness in this way, with major surges in growth occurring as a result of periodic inventions (the railway, car, aeroplane, radio and electricity). Endogenous growth comes from within the existing economic system and can arise from ‘spill-over’ effects (e.g adaptation of machinery used originally in one activity to some other industrial use), using increasingly specialized equipment, the experience curve, and from ‘freeing up’ markets (e.g. the elimination of inefficient firms and monopolies, the removal of restrictive labour practices, etc.). In reality, it is not possible to distinguish at the margin between the two growth processes. In particular, technological progressiveness is usually an on-going incremental process involving the continuous investment in R&D by firms and governments rather than a series of ‘one-off shocks. The invention of the microchip and the development of computer-based manufacturing and information technologies, as noted above, are good examples of the spread of incremental know-how and applications. Governments can stimulate the growth process by increasing current spending in the economy through tax cuts (see FISCAL POLICY), and by increasing the money supply and reducing interest rates (see MONETARY POLICY). Additionally, they can operate on the supply side of the economy by promoting enterprise initiatives and providing resources for improving productivity and research (see SUPPLY-SIDE ECONOMICS, INDUSTRIAL POLICY). See PRODUCTION POSSIBILITY BOUNDARY, CAPITAL-LABOUR RATIO, CAPITAL-OUTPUT RATIO, CAPITAL-WIDENING, CAPITAL-DEEPENING, POTENTIAL GROSS NATIONAL PRODUCT, DOMAR ECONOMIC-GROWTH MODEL, HARROD ECONOMIC-GROWTH MODEL, SOLOW ECONOMIC-GROWTH MODEL, INTERTEMPORAL SUBSTITUTION, NEW AND OLD PARADIGM ECONOMICS, SUSTAINABLE DEVELOPMENTS. Gemmell investigated the effect of three education levels on economic growth in different countries during 1960-1985. What is still unclear is the effect of remittances on economic growth. The choice of the explanatory variables of economic growth is no easy matter, we have models that assess the relationship between economic growth and trade; economic growth and foreign direct investment (FDI); economic growth and globalization; entrepreneurial activity, investment and public spending and still others who seek to introduce variables not as frequent as religion, culture, life expectancy, among others. Within the framework of the knowledge society, the process of economic growth needs modifications of the ruling framework, with a view to increasing the market access for the capital, the goods, the services and the labor in everybody's advantage. Aid had a significant positive effect on economic growth over the period as a whole. China's economic growth is focused on the development of manufacturing and heavy industries, export and fixed asset investment, and energy consumption is thus growing rapidly. The importance of economic growth cannot be underestimated as it entails many welfare maximizing consequences. STOCK MARKET AND BANKING SECTOR: ARE THEY COMPLEMENTARY FOR ECONOMIC GROWTH IN LOW HUMAN DEVELOPED ECONOMY? The central bank's comments came days after the export-reliant island raised its 2017 economic growth outlook to a three-year high. The purpose of the present study is to investigate the effect of foreign direct investment inflows in postal and courier services on the economic growth of Pakistan. Research has been conducted on the impact of capital inflow on economic growth of Pakistan. He said Georgia's economic growth will be equal to 4 percent in 2015, while earlier the Georgian Finance Ministry forecasted the growth to be at 5 percent.